These sculptural works by Randi Jørgensen (b. 1974) and Katrine Malinovsky (b. 1976) are a result of their common interest in combining architecture, objects and narration, and a fascination with monumental scale installations in which a dynamic exchange with the viewer and a specific space are emphasized. Randi & Katrine have worked collaboratively since 2003. Anthropomorphic houses, artificial gardens, mechanical ships and vernacular architecture are recurrent themes in their large-scale works. 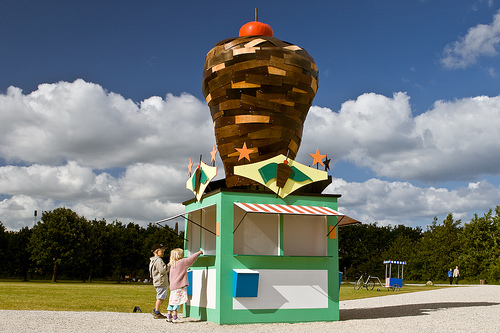 Recently the artists have made a number of psychadelic public sculptures around Denmark and South Korea, including a teapot garden house and a pinewood forest-themed playground. They have also been commissioned for a number of public works, including a recent award to create the facade of a Danish public ferry. This exhibition runs concurrently with Anders Bojen & Kristoffer Ørum: AutoBiography. Reception: February 9, 6-9pm Open House: February 10, 2-5pm During PowerSuit Camp Week we put aside our fears and ask ourselves: if we could do anything, what would it be? Join us for this project organized by Flux Artist-in-Residence Aliya Bonar.